In the margin I had written: Evil is unbelief. I was startled that it was so clear and so simple. I seemed to have forgotten that insight. I pondered a number of people whose fruit is ‘bad,’ who live in evil, and I realized that the one basic about them all is unbelief. They don’t believe God; they believe their own thoughts. They don’t believe Him when He speaks. 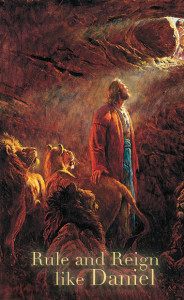 In the midst of enormous evil, Daniel believed. He believed above all – in spite of all – that his God was sufficient, sovereign and powerful. Yes, his belief came out of his relationship, his worship, the proving of God in crisis…but Daniel believed! He fought to believe. And that is the work, the only work. How we are tempted to work at self-preservation rather than faith!